The brand-new year is here, and that means New Year’s resolutions are in full swing. Just stop by your local fitness center and see how many people are using the cardio machines. I am guessing you will see a lot of people who can’t get an open machine. They are all in there for one thing and that is to get back into shape after gaining some unwanted weight during the holiday season. How can you tell you are getting off in the right track with your workout routine? Here are some tips to get you off on the right foot. Create realistic fitness goals for yourself. You wouldn’t want to create an unattainable goal like qualifying for the Boston Marathon in Pittsburgh when you have never run more than one mile before. Or being able to squat 500 pounds when you don’t even know what a squat is. You know yourself best, so find goals that are realistic for you. Create a routine that will work for you and that you enjoy. If you absolutely hate to run, find an exercise that would be more fun for you. That way, it becomes less of a chore. I have always hated doing chores and would typically try to get out of doing them. So, if you enjoy dancing, incorporate dancing into your workout routine. Check out some classes at your fitness center or even the internet or your TV’s on-demand feature. Recruit someone you know who will hold you accountable. Accountability goes a long way when it comes to staying with your workout routine. You will less likely skip out on a workout when someone is waiting to join you at for a walk or at the gym. 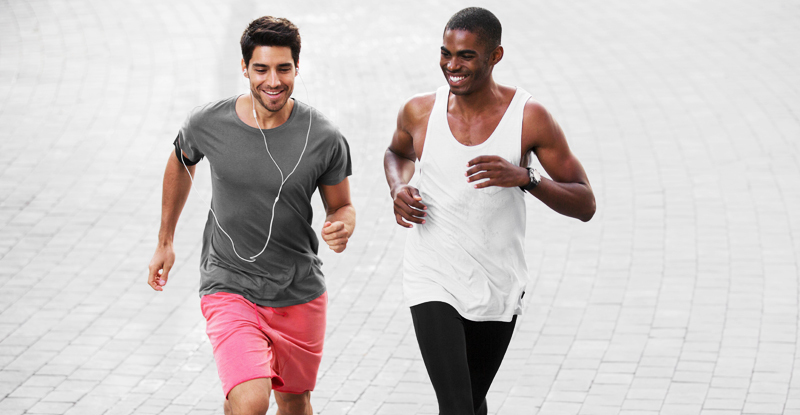 If that person is in a different city, you can still hold each other accountable through apps that keep track of each of your physical activities throughout the day. Feel free to challenge each other in person or online. Many of our health coaches challenge each other with steps through one of these activity apps. Write down or create a list of your personal reasons of why you want to be more physically active. These are your personal reasons. You don’t have to share it with anybody else unless you want to. Here’s an example: “I want to be more physically active so I can stay as healthy as possible for my growing family.” Whatever your personal reason for being more active, write it down. This will become very useful on the days when you need extra motivation. Remember to start where you are at physically and work up. If you have any medical conditions, consult with your doctor about assisting you with a workout routine. Everyone’s fitness levels are different, so be mindful about your own and don’t try to compare yourself with others. An example would be starting off with comfortable weights on the machines that you know you could perform with proper form. Embrace your rest days. If you think about it, you didn’t lose your fitness level in a matter of one day. Our bodies are not machines that can be fixed by replacing a broken part. Our bodies need time to rest between workouts in order recover. Enjoy your body’s healing time and know it can perform better for your next session. Be creative. Just because you have a gym membership, that doesn’t mean all your sessions need to be at the gym. Try out various classes around the area. Many types of classes are offering free trials like cycling classes, yoga classes, wall climbing classes, etc. The sky is the limit! Track your progress. I don’t know about you, but I like to see how I’m progressing along with my fitness level. It might just be me, since I’m a little bit of a nerd when it comes to data, but seeing improvement in how much weight I can lift or even how much faster I can run a mile is very rewarding and motivating. Good luck out there with you starting your workout routine. Hopefully these tips were helpful in getting you started on the right foot. If you are looking for workout routine examples, please search our site.